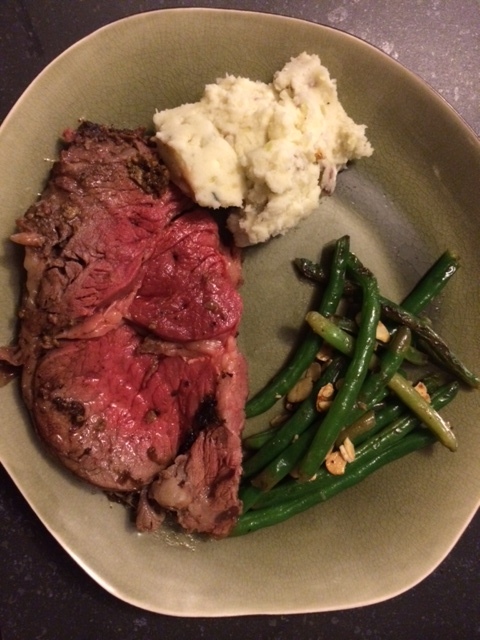 Mustard-Peppercorn Rib Roast | Om nom nom! Season the roast with salt and pepper and cover tightly with plastic wrap – refrigerate overnight. Remove roast from fridge for one hour prior to cooking. Place the garlic and salt together in a bowl and make a paste. Place the peppercorns in a plastic zip-top bag and crack them on a work surface with a mallet or frying pan until they’re broken into small pieces but not pulverized. Put in the bowl with the garlic-salt paste, add the mustard, and mix until combined. Rub the meat all over with the mustard mixture. Heat the oven to 450°F and arrange a rack in the lower third. Set the roast fat-side up in a roasting pan. Roast for 45 minutes. Reduce the oven temperature to 350°F and continue to roast until an instant-read thermometer inserted into the center registers 125°F for medium rare, about 75 to 90 minutes more. Transfer the roast to a cutting board, tent it loosely with aluminum foil, and let it rest for at least 20 to 30 minutes. Remove the twine and bones, slice, and serve.